WOW! How about a round of ap-PAWS for my brother on his Blast from the Past Fall 2007. He sure is a good writer. He’s also a FANTASTIC brother. I really love him alot, and he loves me. I think we are FINALLY getting used to this “blog” thing. We have never been the best at routines. We’re not all the way potty trained. 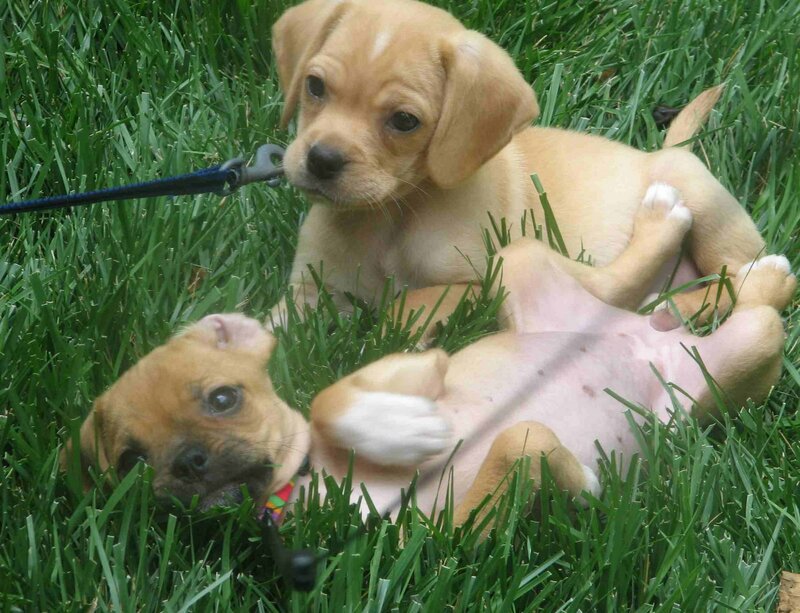 It’s just sometimes harder with two puppies of the same age, but we really do try to please. Every day we learn more and more. Well, like my brother said, this post is about the Winter of 2007. It will talk about November and December. November was pretty busy. Our Mommy still had a yucky feeling foot and ankle. We did not like that she was in pain. She left us at the vet around the first part of November, for boarding. 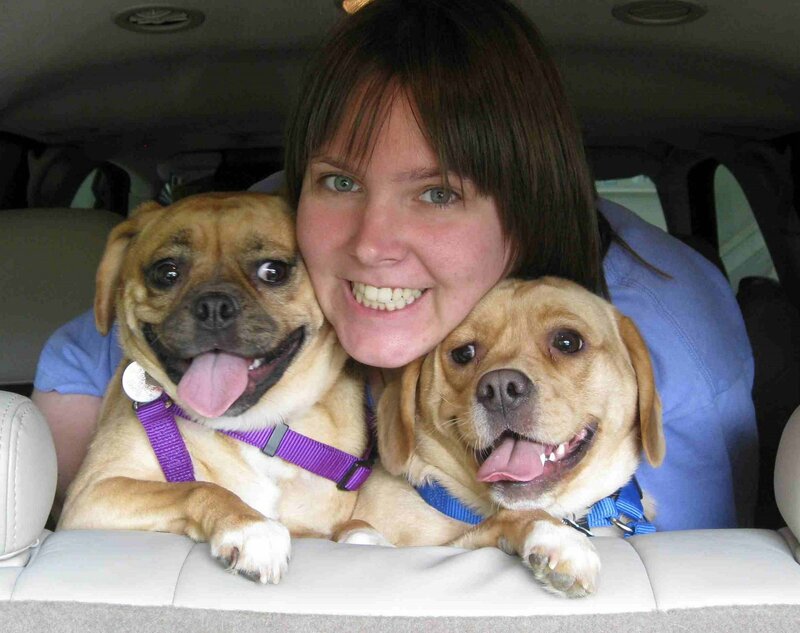 Before she left, she sat us down on the couch for a snuggle and to tell us why. She said that we had to go to the doggie hotel, because she had to go to a place called New York City. She had to go there for a Doctor appointment. She said that the doctor that could make her foot all better was there, so she would have to take a big air plane there. We gave her lots of kisses. We enjoyed our time at the vet, because everyone there loves us and plays with us! Our Mommy got back and told us about her trip. She also said she missed us. She was happy but also a little sad. The reason she was sad, was because when she saw her doctor, she learned that she would have to go to New York to have surgery. The only time she could go was for Christmas. We said we didn’t mind spending Christmas somewhere else. We started thinking about the toys we would pack. We were excited about this whole New York place, anyway. Then she said that we would have to stay here. She said that the air plane would be scary for us, and that the hotels were a bit expensive. Also, she wouldn’t be able to care for us as well, because after surgery she would be in the hospital for a few days. Doggies aren’t allowed at the hospital. She said that she would really make our November and the part of December that we were together really special. She told us we could have our family Christmas before the REAL Christmas. She also assured us that Santa would find us at the Doggie Hotel on Christmas and when we woke up on Christmas Day we would have a special time. She also told us that she would take lots of pictures and tell us lots of stories when she saw us again in January. Our Mommy really kept her promise, and then some! In November she bought us some really pretty Winter Sweaters so we would look pretty and be nice and warm. My sweater was so pretty and Mommy said I was truly GORGEOUS in it. My brother’s sweater was green and striped and he was really handsome. 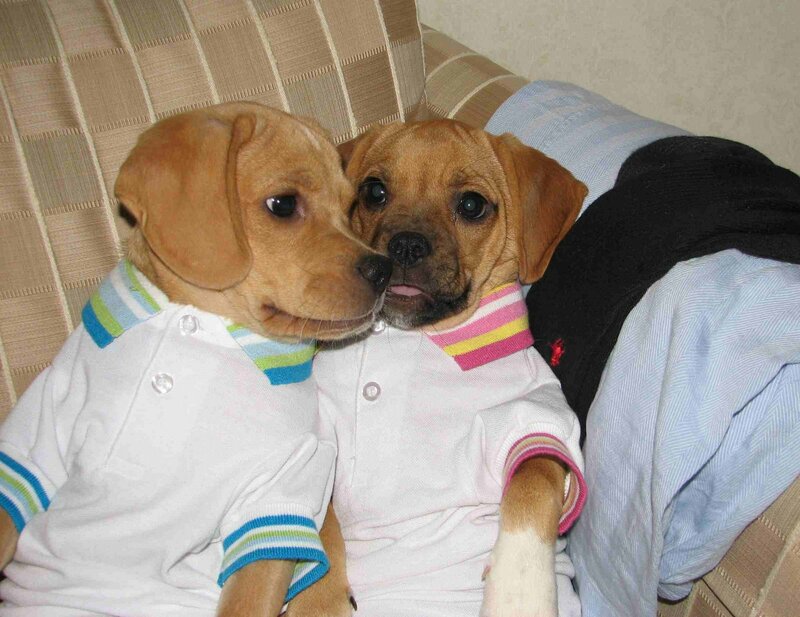 We enjoyed it when our Mommy would help us dress up in our nice warm sweaters. We still have them with our other clothes. Now that we are two, we have LOTS of clothes! We also learned more and more about the Holidays. Mommy told us all about Christmas, and about Santa. Mommy bought us each a stocking and hung them on our kennels. We LOVED looking at our pretty stockings. We also were in the family Christmas card picture. We watched lots of Christmas movies with Mommy also. She got us some Santa hats and Reindeer antlers. She taught us Christmas songs. On Thanksgiving she told us how thankful she was for both of us. She said that we are her babies and her best friends. She loves us very much and always will. She gave us our Christmas presents on Thanksgiving day and we made that our “Family Christmas Day” since that our family would be apart from us on Christmas. She brought us to see Santa Claus! We really enjoyed it. I told Santa what I wanted and Jack told Santa what he wanted. Our Mommy, Grandma and Grandpa really made our Holiday Season of 2007 a special one. The night before they had to bring us to the Doggie Hotel for our Holiday Stay, Mommy read us a book that she bought us, called My Dog Marley. It was funny! We even got to meet Santa Claus! We were not scared. He was nice. Do you see our names on the Family Christmas Card? Our Mommy took some time out to remind us, that even though she was happy we are her babies. It was also her first year without Sir-C. Sir-C was the doggie that Mommy had before Jack and Me. Our Mommy said that it was hard that Sir-C was not with her. She wanted to show us that he was still with us. The way she did this, was that she gave each of us a special Christmas toy that used to be Sir-C’s when he was alive. She told us that our Angel brother wanted us to have his Christmas toys. Those were his presents to us. 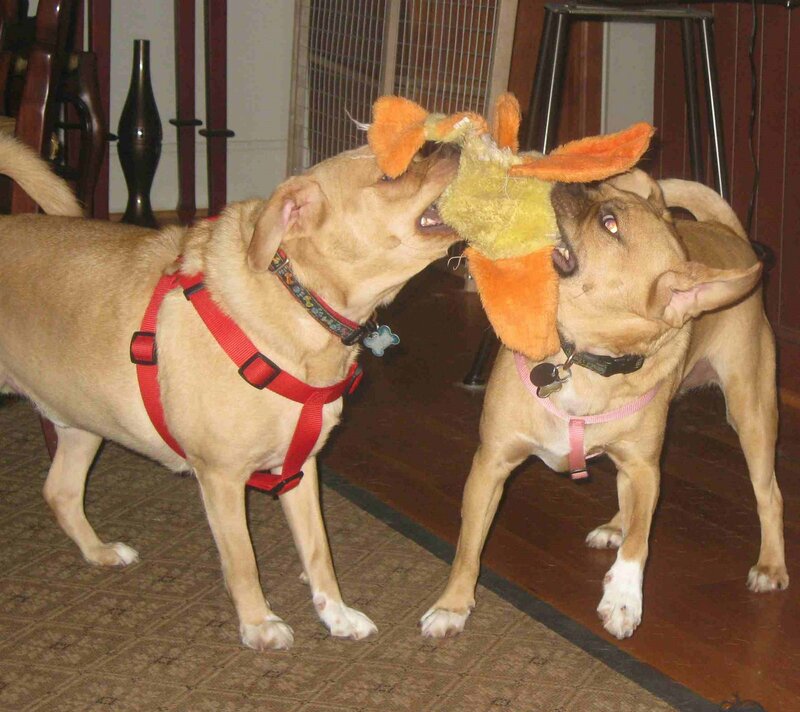 We really were happy that our big brother loved us enough that he wanted us to have his toys. Mommy also made a special poster for Sir-C that she still has. Isn’t it funny? I chewed the book like Marley! My brother also loved the Marley story book! All in all, our Holiday of 2007 was Happy! The thing we learned most, is that our family was a loving family and they were thankful for us and for each other. We learned more and more just how much we are loved. We also loved our family more and more each day. Thank you for reading my Winter 2007 post. Jack will be the next post, sometime this weekend. Stay tuned! It will include an update on what we’ve been up to lately and lots more! My sissy did a GREAT job on that Blast from the Past post. I figured I’d chip in and help her with the Blast from the Past posts as well. I’m going to share some of my “Re-memory-ber-ies” (I’m not the bestest speller, here! Sound it out, Jack, sound it out!) from the Fall of 2007. The Fall months I will include are August, September and October! In August we coninued trying to figure out who we were, learn about our family and where our places were in it. We went to the veterinarin for our regular check-ups to keep us healthy. We also would go there occasionally if our Mommy and Grandma and Grandpa had to go on a trip. Most of all, we continued going out, meeting new friends, and enjoying LIFE with our family! This is our Mommy and us with Mommy’s friend Michelle! 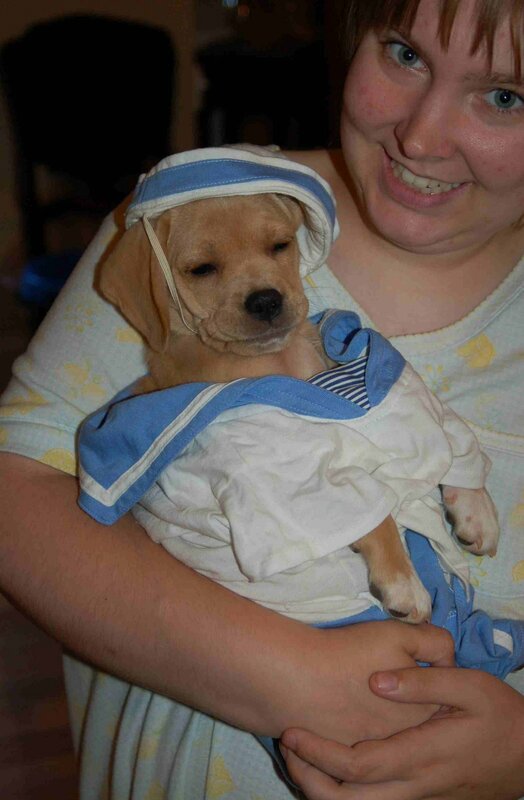 Our Mommy also started at a new school….it is called Salem College. We missed her whenever she would leave for school, but when she wasn’t with us, she was learning and would read us stories when she got home. When she wasn’t with us, our Grandpa and/or Grandma was with us. September 2007 had ALOT of stuff happen. Our Grandma and Grandpa celebrated their anniversiary (25th). Mommy celebrated her 21nd Birthday, Mommy got Stung by a bumble bee one day (but Me and Sissy made it all better by kissing it) and Mommy had a car accident (but again, we made her better with kisses). Mommy said that she realized more and more how thankful she was for us. She loves bringing us on car rides, but was very thankful that she didn’t have us with her when she got in her accident. We coulda gotted hurt, and mommy never wants us to hurt or cry. We love mommy and we want the same for her. October 2007 found us in school. This school wasn’t quite like Mommy’s. 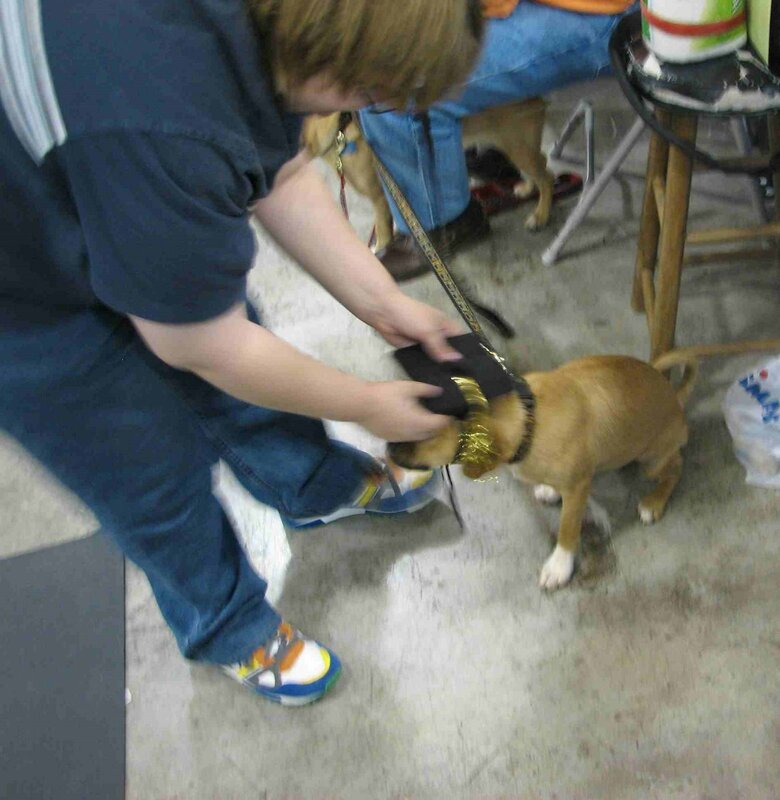 It was Puppy School where we learned how to sit, drop it, hussle, go to kennel and alot more. We also made lots of doggy friends and people friends. We still see our teacher whenever we go to PetSmart. She has a BIG doggie, but I wasn’t scared of him. He is nice. 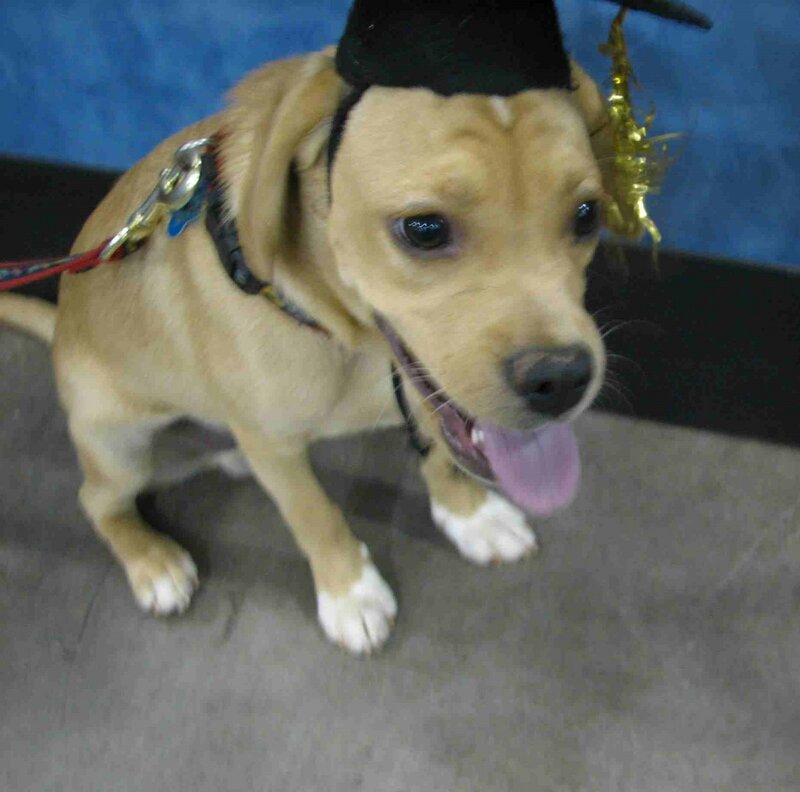 We also graduated from school! Mommy was so proud of us, and still is proud! We learned a whole lot and still know alot of it! We also both had surgery. 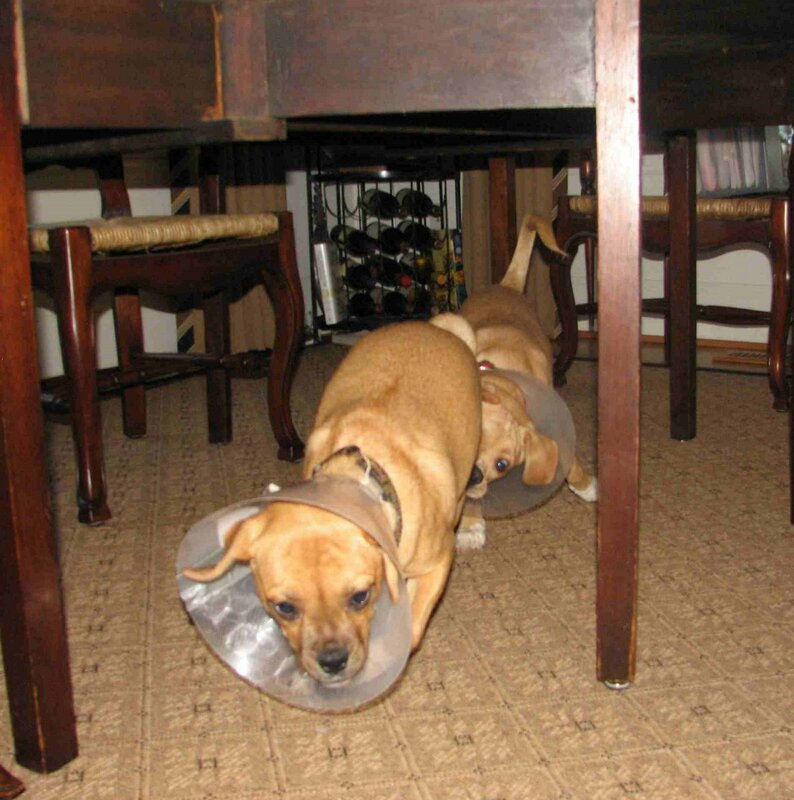 We got what you humans refer to as “fixed” so that we couldn’t have any puppies. 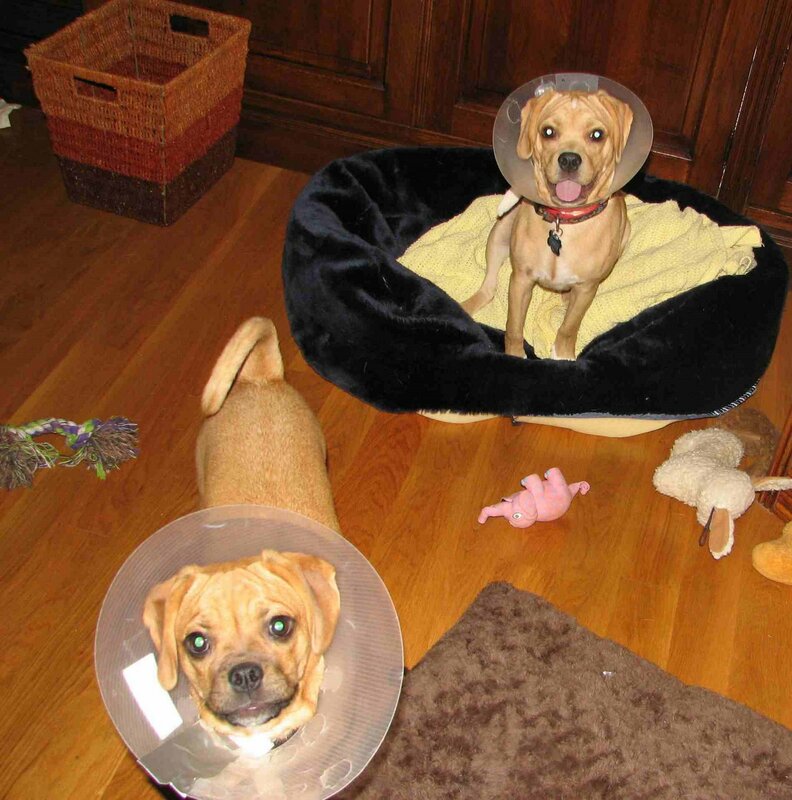 When we got home we did not hurt, but we had stitches. 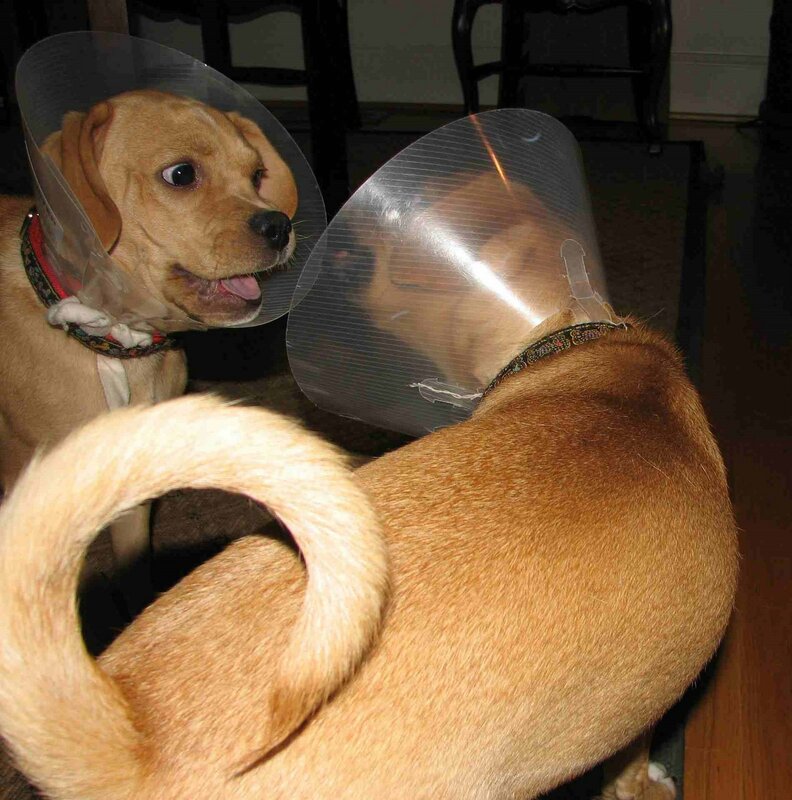 They were really itchy and felt funny. 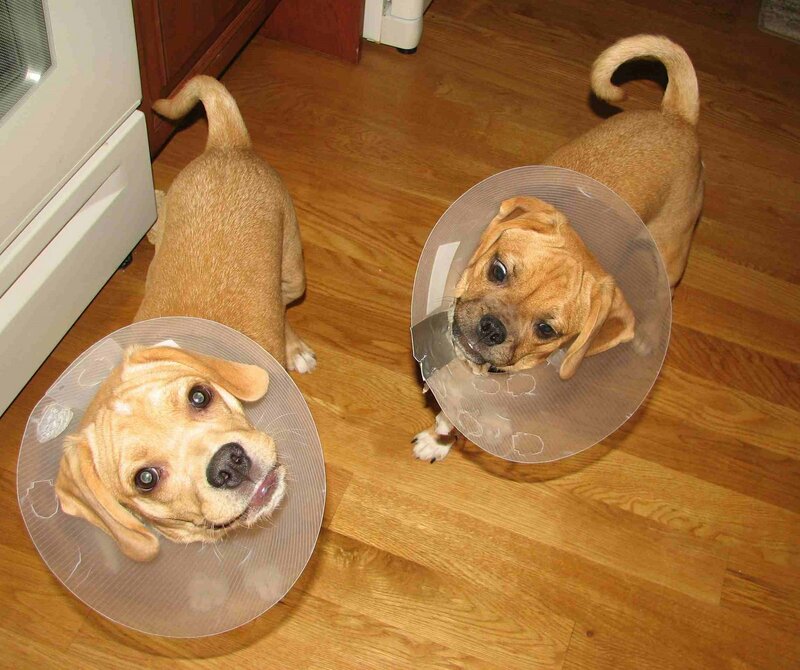 We had to wear cones/E-Collars on our heads. We looked so funny. We also met our cousins who came into town. And we continued to grow and enjoy our life. Our mommy was hurting in her ankle and foot quite a bit during this time. She had a rough time. We kissed her, licked her tears, and cuddled her every night, because between school, having a rough time and her foot and ankle hurting bad, she cried and was not very happy. She longed for every second with us. She loves us very much and always will…..We love her too! 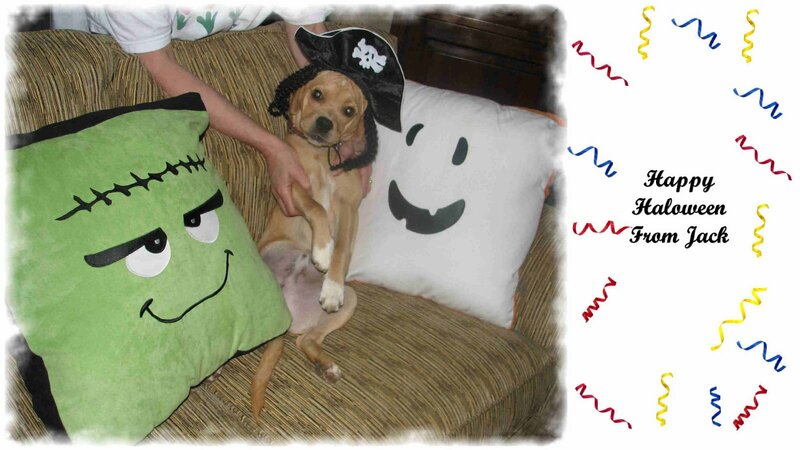 For Halloween, I was a PIRATE! GRRR!!! Captain Jack Sparrow! My sissy was Ella-Belle the sweetest Witch! We LOVED Trick or Treating! Our favorite treats were kisses and tummy rubs. Who could pass those off?!?! From Jack: What we’ve been up to! Things have been SO busy around here. 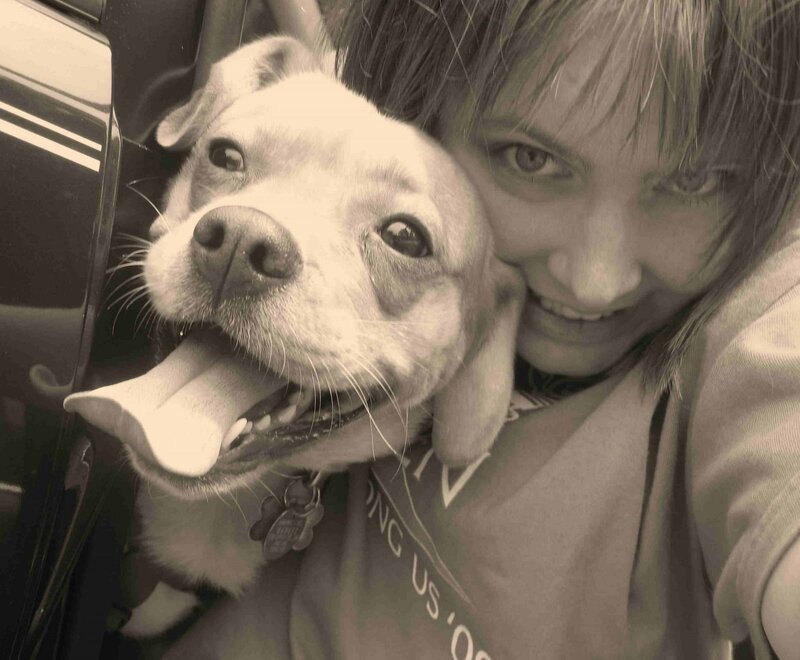 This is the first time I have typed on here, and my Mommy introduced this “blog” in May. Since we are 2 years old (May 4th was our birthday) this site will require some upkeep so people can get to know us; and learn about us. I sat down with Mommy and Sissy and we decided that we would have a “BLAST from the PAST” entry at the beginnig of each month! In these entries we will put pictures from the past. If it is JULY entry then we would put a “BLAST FROM THE PAST JULY” pictures of past July’s. My sissy will be writing and picking out pictures for our first “Blast” entry following my update. As I said, we have been BUSY! 2 times ago when we went, we met Will and his dog. Will works at Barnes & Noble and he has always been helpful to our mommy there. It was funny because it was purely timing that brought us together. 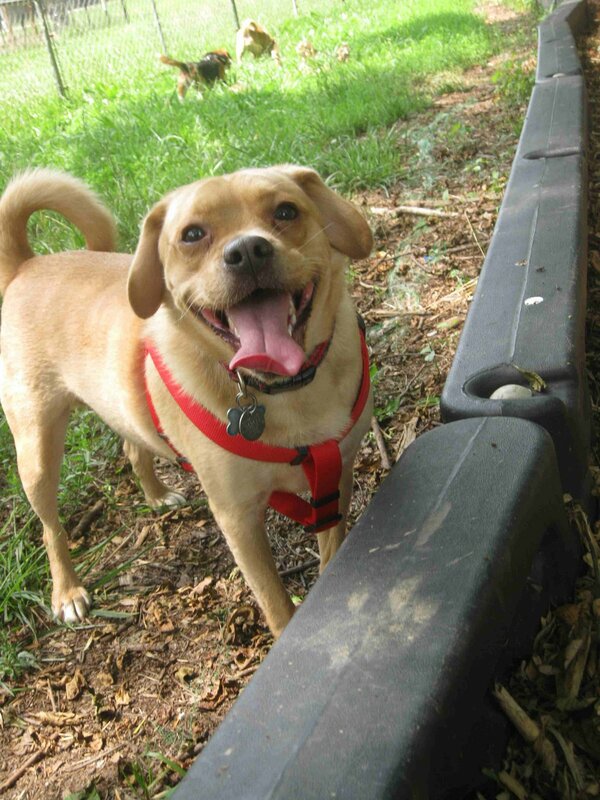 We had a good time playing with his doggy, who is a Beagle. She was really nice (and cute too!) My tail was wagging the whole time! In June our Mommy had to bring us to the vet and board us for a week. This was because a good family friend died. She had a disease called Scleroderma. Mommy, Grandma, and Grandpa were pretty sad for alot of May and June as her death approached. You see, Their friend, Miss Sally, was a really special lady. She was 51 years old and her daughter, Andrea (who is our Mommy’s best friend) is 22. Her birthday is acutally coming up on the 12th! 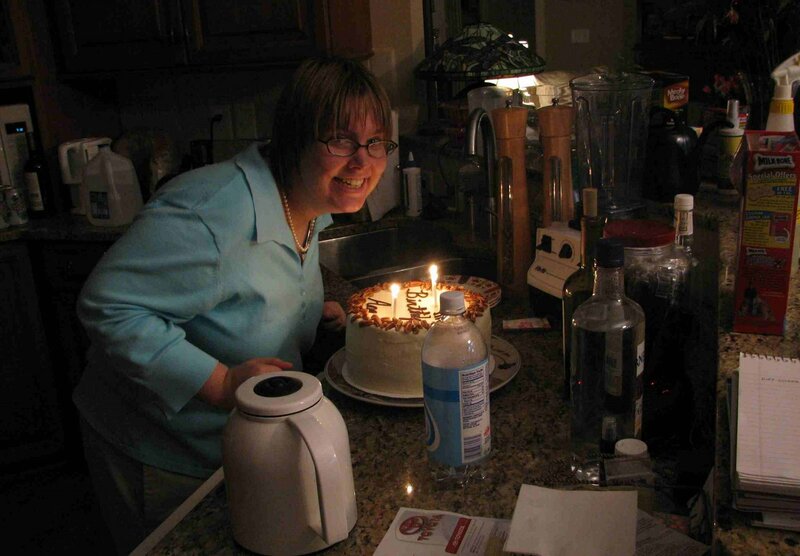 Miss Sally suffered the effects of Scleroderma for a long long time (longer than we have been alive!) She was a fighter! Mommy and Grandma & Grandpa were sad because they knew that their friend would not be here much longer. We did a lot of cuddling and snuggling; and licked all their tears as the events of Miss Sally’s last weeks unfolded. Our family was very sad for their friend, and they boarded us to go say goodbye to Miss Sally and attend her funeral. When they got back, they were still sad, but at the same time they were happy to see us. We gave them lots of kisses. My mommy said that Miss Sally lives with our BIG BROTHER in Heaven now. Our BIG BROTHER was Sir-Cinnamon. We never met him though! He was a Sheltie. He was Mommy’s dog before we were her doggies. He died on June 15th 2007 and she got us 9 days after he became an Angel. Mommy assured us that Angel Sir-C was waiting @ the Rainbow Bridge for Miss Sally and wanted to see her and show her around Heaven. When Mommy got home it was still June. Right after they got home, our Grandma got an email that one of her long time friends was getting married. Grandma and Grandpa went to the wedding (which was five hours away, in Morehead City —same place where they were for Miss Sally’s funeral). We were VERY HAPPY to hear about the wedding and Happy that our grandma and grandpa could finally go to Morehead for a happy occasion. You see, they have been to Morehead 3 times now—in a row—for funerals of friends. 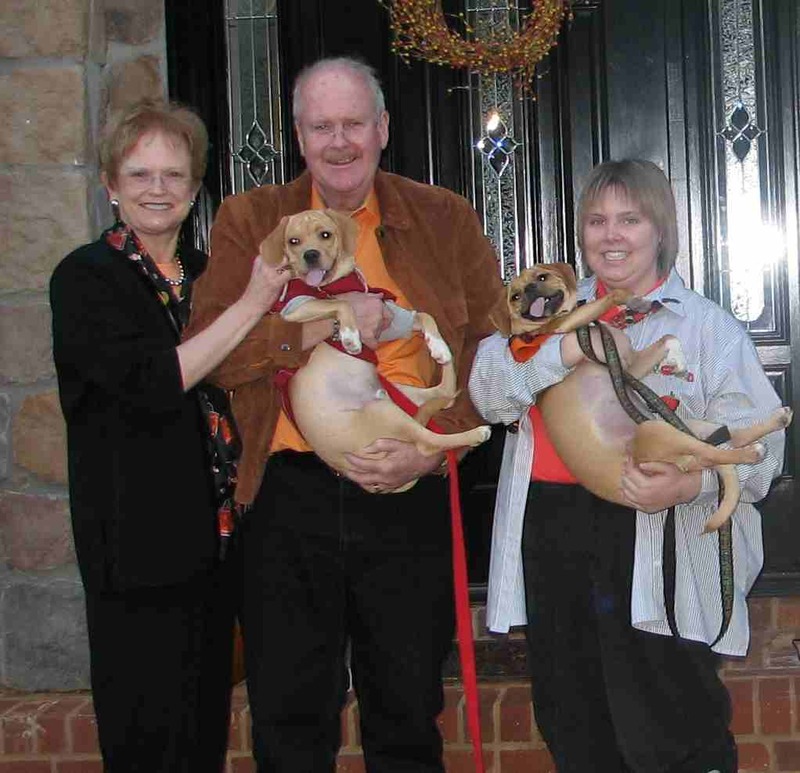 The first was in October when their friend, Pat (Who was Miss Sally’s Mother; and Andrea’s Grandmother) died suddenly. The second was in February when a friend of Grandma’s died @ the age of 104…. …and then June, for Miss Sally. So we were happy to hear that Grandma and Grandpa would go for a wedding! We celebrated with them and gave them kisses and snuggles. 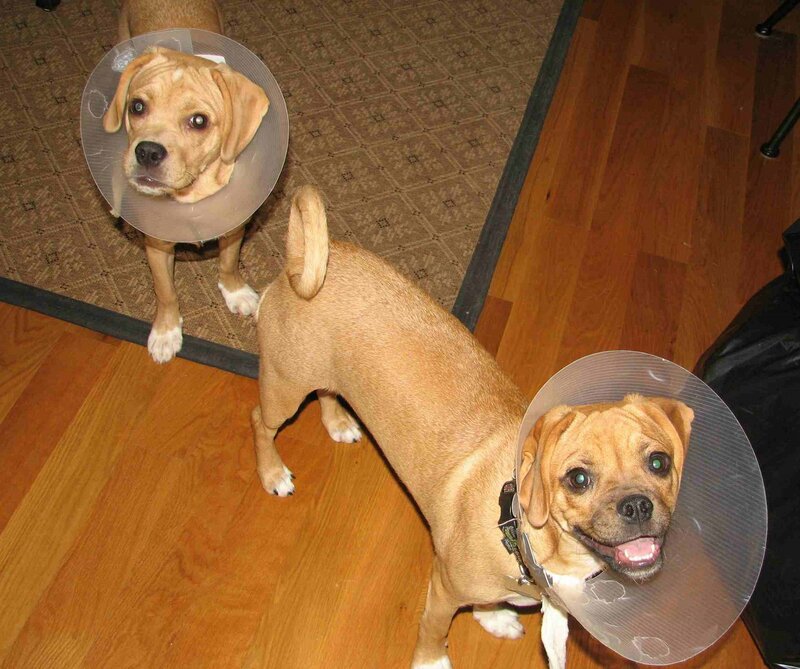 We wagged our tails so hard they almost flew off! We missed our Grandma and Grandpa while they were gone, but our Mommy was home with us and we had fun with her. Some friends of hers even came by and played with us on Friday and on Saturday another friend came by. 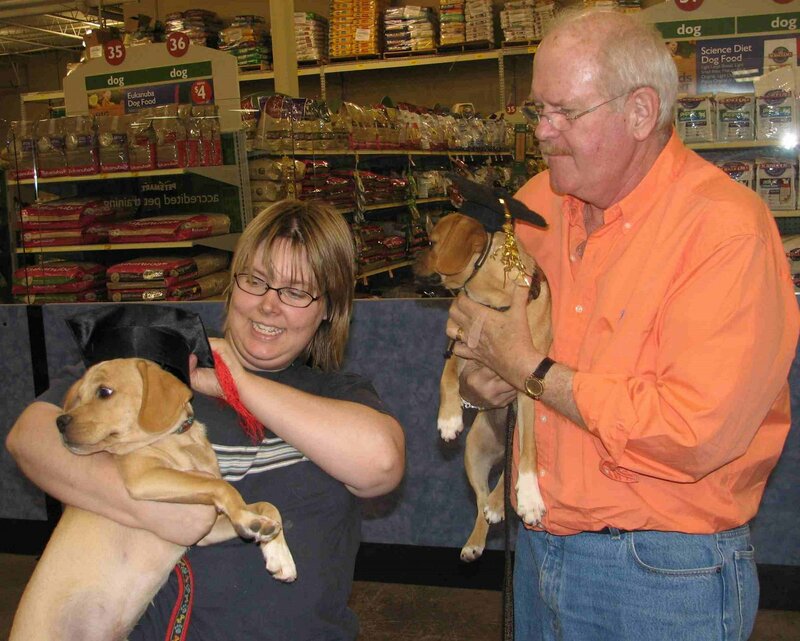 We LOVE to make new friends, dogs and people alike! We LOVE to meet people and kiss and cuddle! We were happy when our Grandma and Grandpa got back! July is here already. We did not watch fireworks, but we did hear them. Our mommy went to watch fireworks down the street. She did not bring us because she didn’t want us to be scared. We heard them and were not very thrilled. We were a little scared of them, but our mommy cuddled us and kissed us. She told us the fireworks were saying “Happy Birthday” to America! The rest of July we plan to go to the dog park, and play, and get all our snuggles in. Last night was a little bit sad, for me especially. Nothing TOO tragic. My sissy, Ella, ripped up one of my favorite “babies”. His name was “Squackers” and I named him myself! He was a duck with a square belly that had squeekers all in side his tummy and his feet. I named him Squackers because he had squeakers and because ducks say “quack”. I was sad about my Squackers being ripped up, but Mommy let me kiss him goodbye and told me he was going to the Rainbow Bridge and Angel Sir-C would take care of him! From Jack and Ella’s Mommy…. 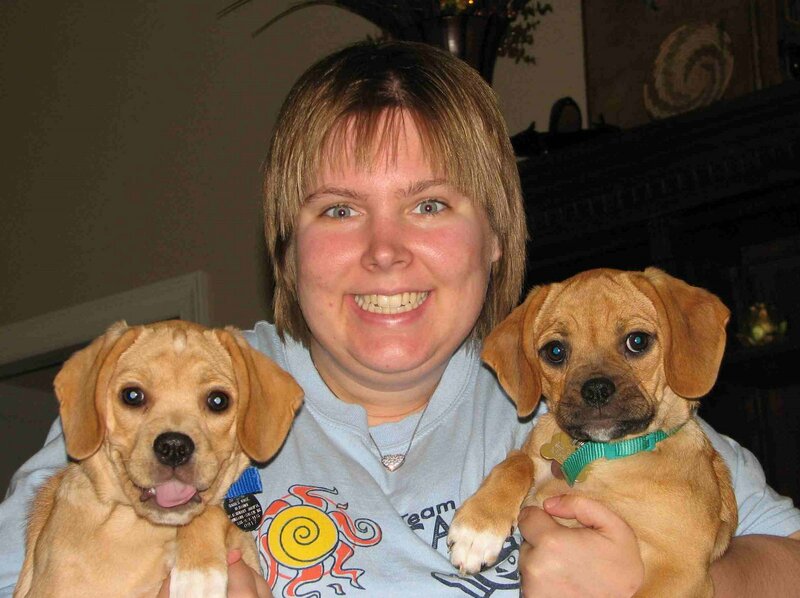 My name is Ann and I have two incredible puggles, Jack and Ella! 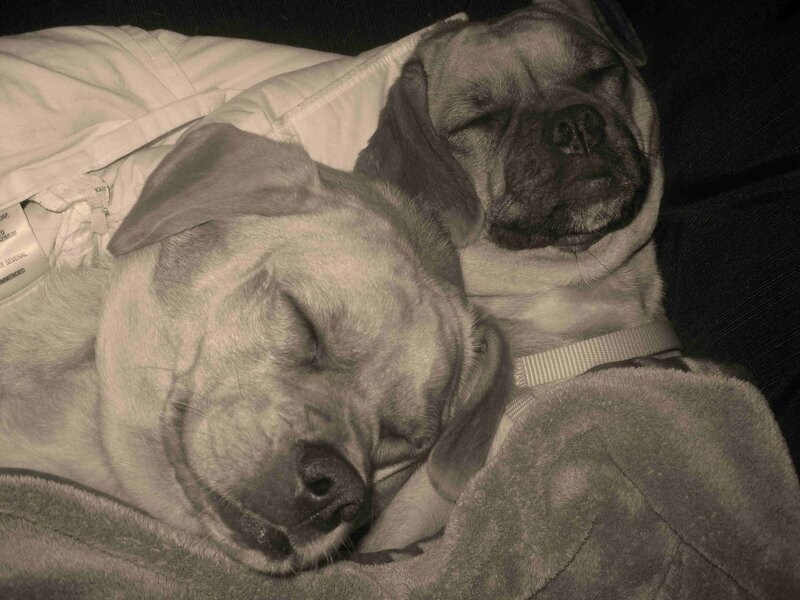 I love my Puggles so much. 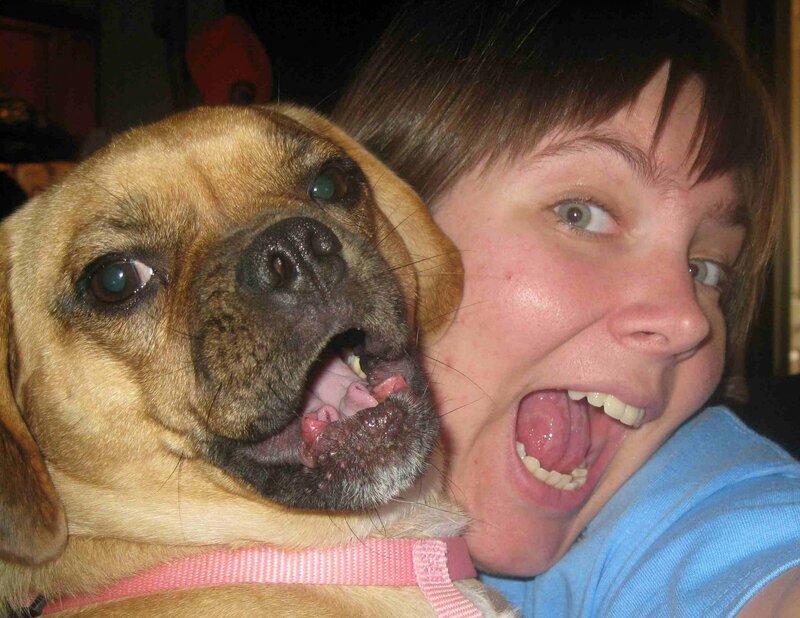 Let me explain, first, that a Puggle is a type of dog that is the result of a Pug and a Beagle. I can not talk about Jack and Ella, without first talking about their Angel brother, Sir-Cinnamon. 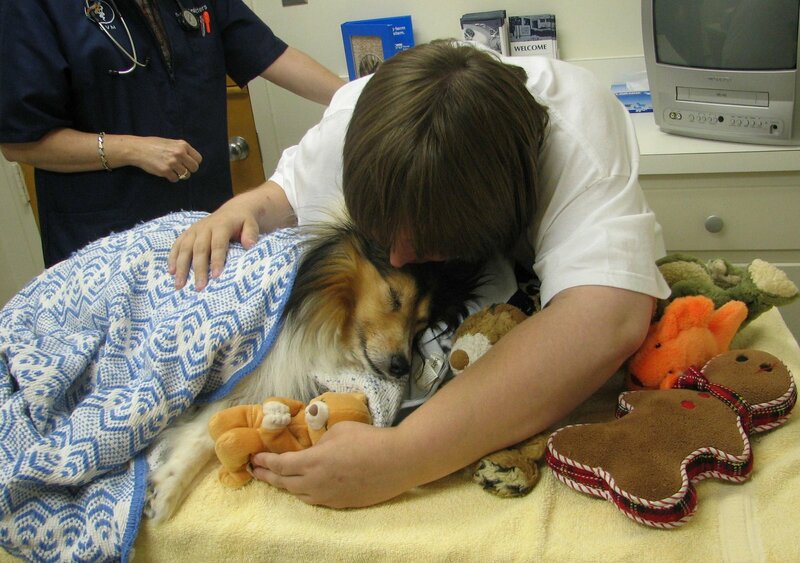 Sir-Cinnamon, aka Sir-C, was our Sheltie who we had on our earth and in our family for 13 years. 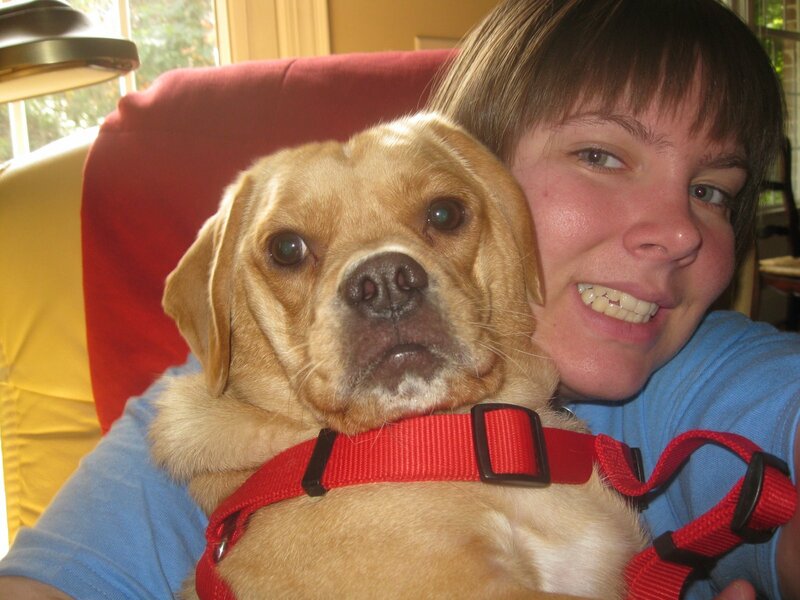 He was not just a “dog” but a member of our family, and he was my baby. 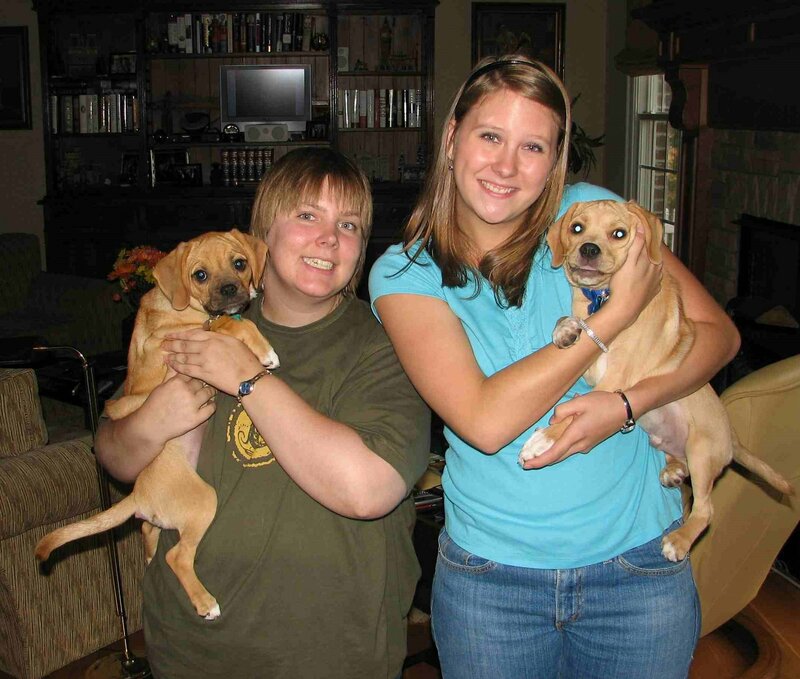 You see….We got him when I was 7 and a half years old, and he was a puppy. 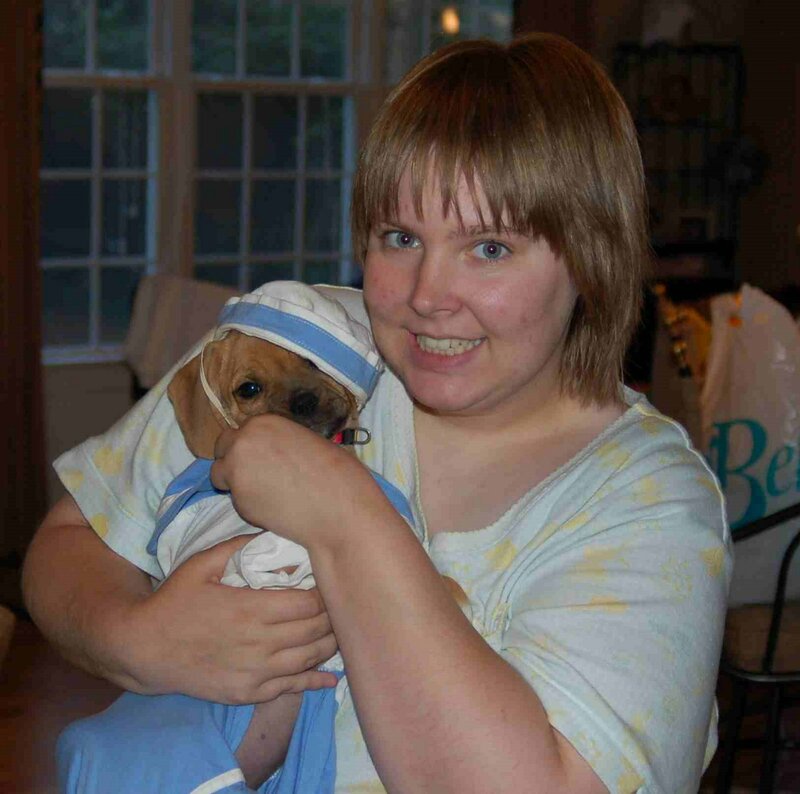 The two of us grew up together, and grew very close….and he grew to be my baby! He was very attached to me and loved me very much. I also felt the same way about him. We were best friends. Many times I told Sir-C that he would be my best friend forever and it would be hard for me to ever love a boy as I loved him! Upon returning from a cruise in June 2007, Sir-C began showing signs of senility. During that same week, he got worse and worse. Our family was not sure if he had one stroke maybe while we were on our trip and he was at the vet, or if he may have been having some mini strokes. It progressed quickly, and he got to the point where even sitting in his bed, he was rocking, his eyes were going back and forth, and he was not comfortable. Though we loved him like crazy, and could not stand to let him go, we also did not want to put him through test after test, considering he was NOT a big fan of going to the vet. Had it been a cancer that they had discovered, this would have been a similar situation with what a person goes through, with more trips to the “doctor” and we didn’t want him to live an unhappy life…..
By Friday June 15th, we made the incredibly painful decision that he needed to be in Heaven and not suffer. We all piled in the car, I brought a bag with some of his favorite toys including his Gingerbread man, his Bubbles the fishie, his teddy bear, his blankie, his turkey lurkey and his snuggly blankie and his big blanket. I also brought a prayer bear with me. We got him on the table and I held him and spent some precious time with him. I showed him the urn which we thought would be the best. The thing that really made us comfortable with what we were doing, was the fact that this was one of the only times we had seen him at a vet setting, with the doctor there, and he was not shaking or nervous. It was almost as if he was telling us he was ready and thankful for us understanding this. I kissed him and rubbed him and sang you are my sunshine, as my precious boy exited our earth and flew on to Heaven, with his beautiful Angel body in my arms. I hugged him, and shed some tears. One of the hardest parts, upon loosing him, was coming home to an empty bed….not hearing his jangling collar at night, etc…. 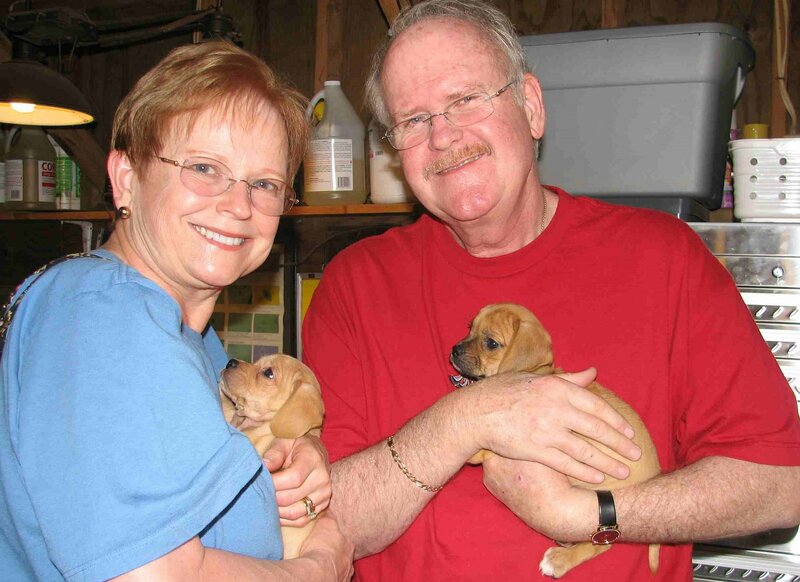 We knew that he would want us to be happy and take care of another puppy or two, who needed a home. 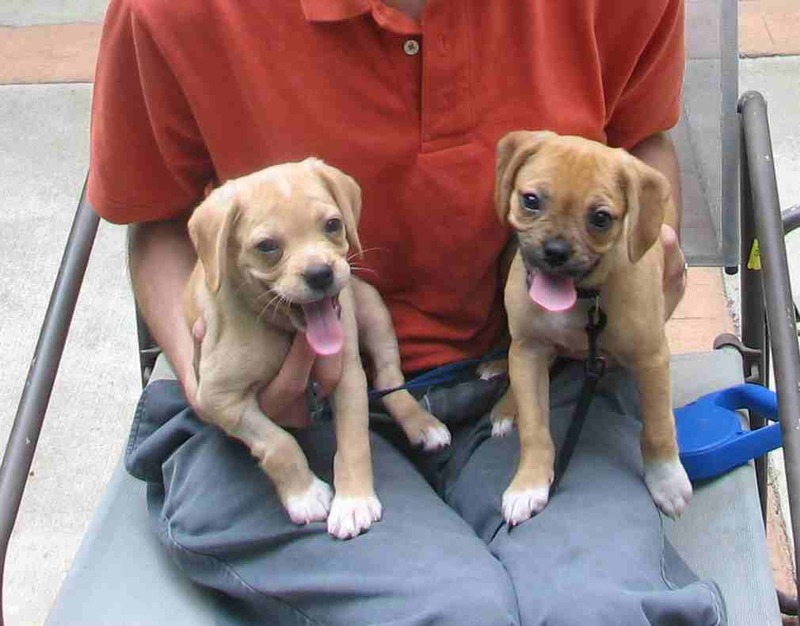 Though we were still in the process of grieving, I did learn about Puggles and thought that Sir-C might like to have a baby brother and/or sister. 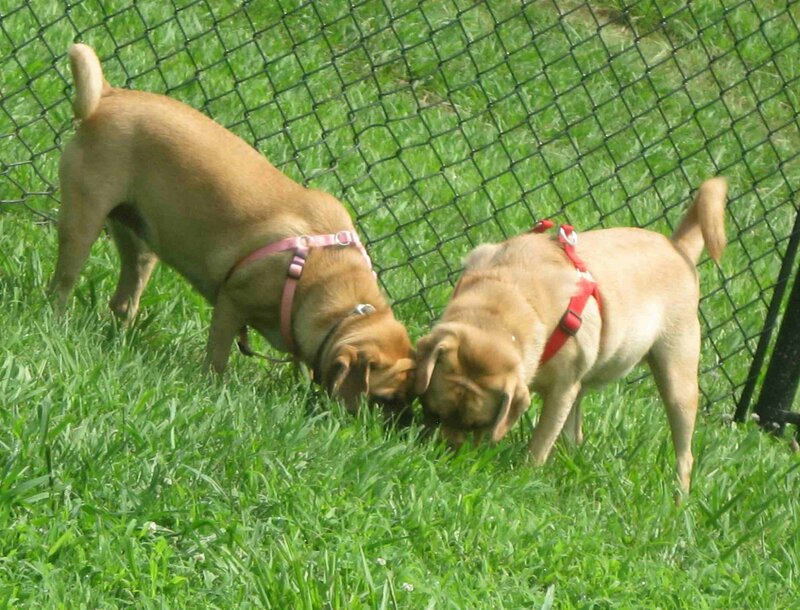 On June 24, we headed out on a journey to a breeder and we brought home two 3pound baby puggles, brother and sister, that we named Jack and Ella. 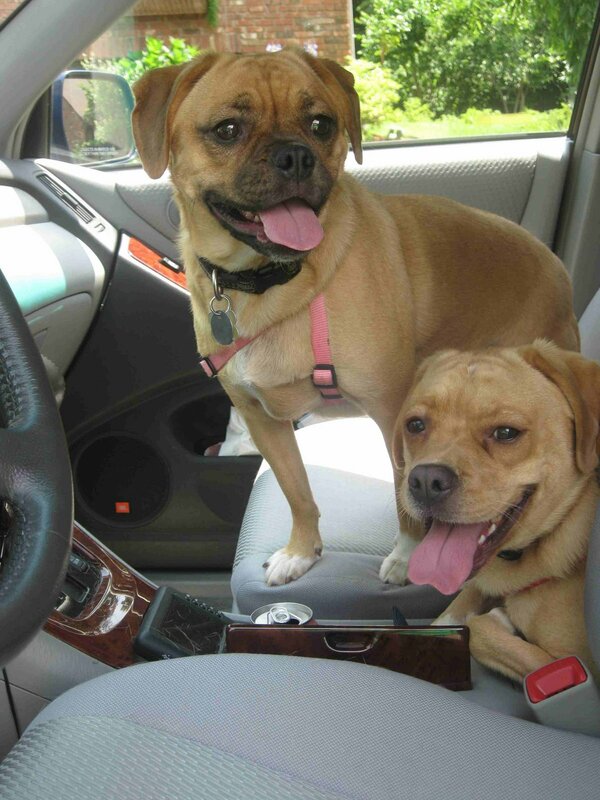 We were delighted to have two cute and happy puggles. However, our babies were extremely sick upon coming home. 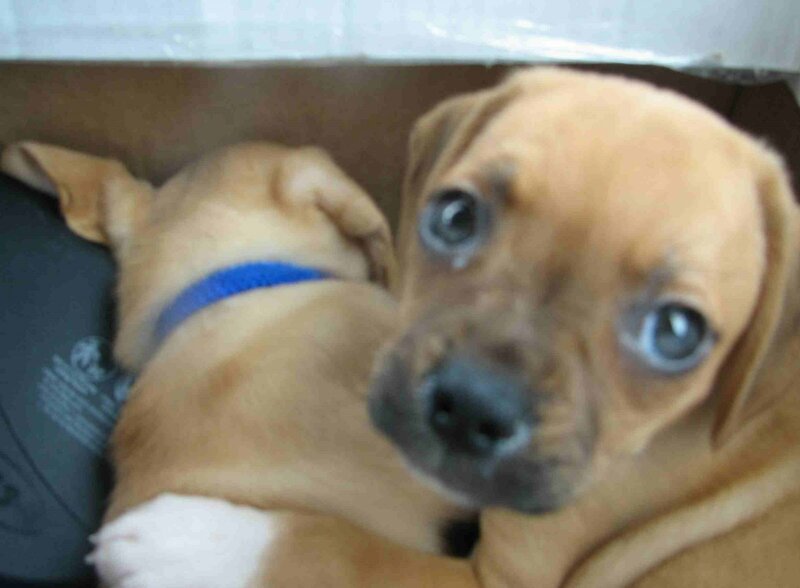 They were three pounds and were only six weeks old. We learned quickly, that the age of six weeks is quite young for puppies to leave their dog mommy and come home, and we paid for this dearly. 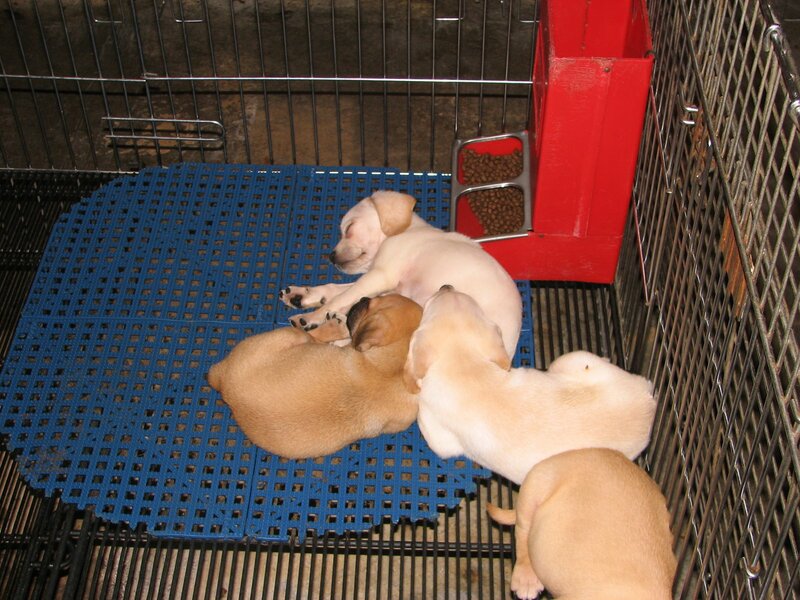 We experienced some hard times, with both of our puppies very sick and with some worms. 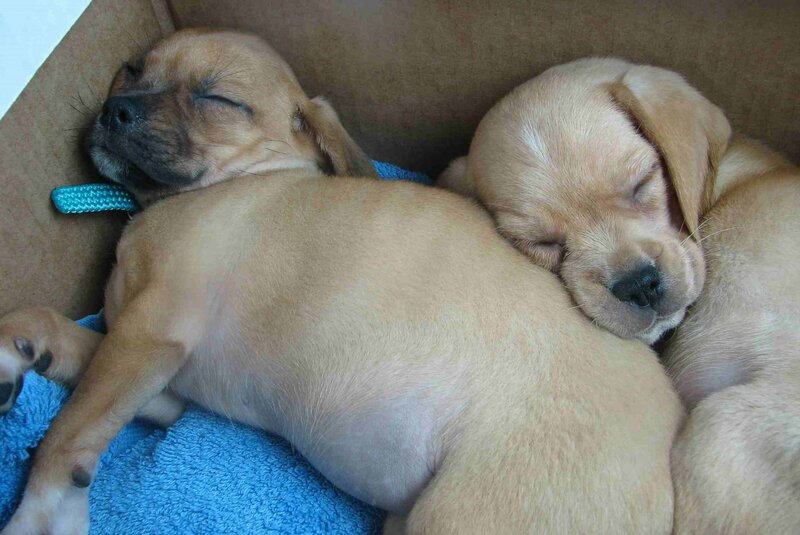 They were lethargic and not well….which made us even happier that we got them when we did. Had we waited three more days, little Jack might well have died at the breeder. On their third day with us, Jack took a turn for the worse. He became lethargic, refused to eat and drink, and developed a very high fever (106 in a dog is more dangerous for a dog than it is for a person, so he was not well at all). We rushed him and his sister to the Emergency vet, and were shocked when the doctor said he was severely dehydrated, it could be parvo, they wanted to keep him in the ICU there for dogs…..
Over the night he fought so hard, and I am certain that Sir-C, up in Heaven, had a few talks with God, and held his little brother’s heart in his Heavenly Paw, but when we picked him up the next day he was feeling and acting a bit better! We brought him and his IV fluid to their regular doctor/vet and they kept him and did the Parvo test. We were so happy that he did NOT have Parvo….I literally got on my knees and cried my eyes out, thanking God, and Sir-C for this miracle. He was still a weak little boy, but after a few weeks he and Ella grew stronger, healthier, sillier, and our hearts continued to overflow with love for these two amazing puppies! We love our puppies and always always will!!!!! 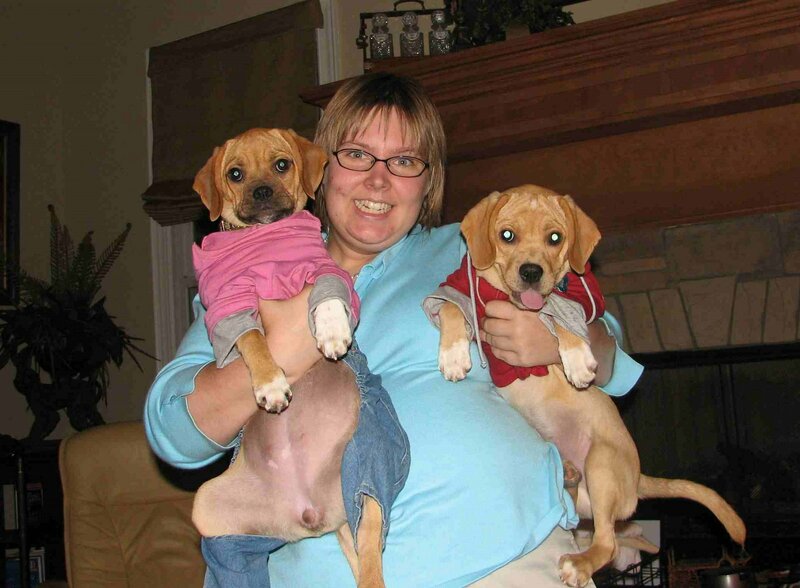 While Jack’s health problem happened in puppy hood, Ella had a problem in February 2007 (before turning a year old in May) when she slipped in a snowfall. She did not hurt, which was good, however, she did have trouble with her back paw. Upon bringing her to the doctor we learned that this was due to a genitic problem that may well run in her family. We learned that she had hip displasia in both hips, and medial luxating patella (displaced kneecaps) in both back knees. She had her first surgery in Feb. of 2007 and may well have to have more in the future. She came through the first surgery to correct the medial luxating patella that was somehow injured in the snow…I think it was slippery and she zigged when she should have zagged, but the good thing as we caught this early in life, and we have learned just how resilliant she is…..
You would never know it today, that she has these issues with her knees and hips….Especially at breakfast when she is jumping to your chest and ready to eat up all her food! She is like a kangaroo on steroids with her jumping! SO FUNNY!!!!!! Let me finish this first “blog” post by telling you about their favorites and what they like to do! 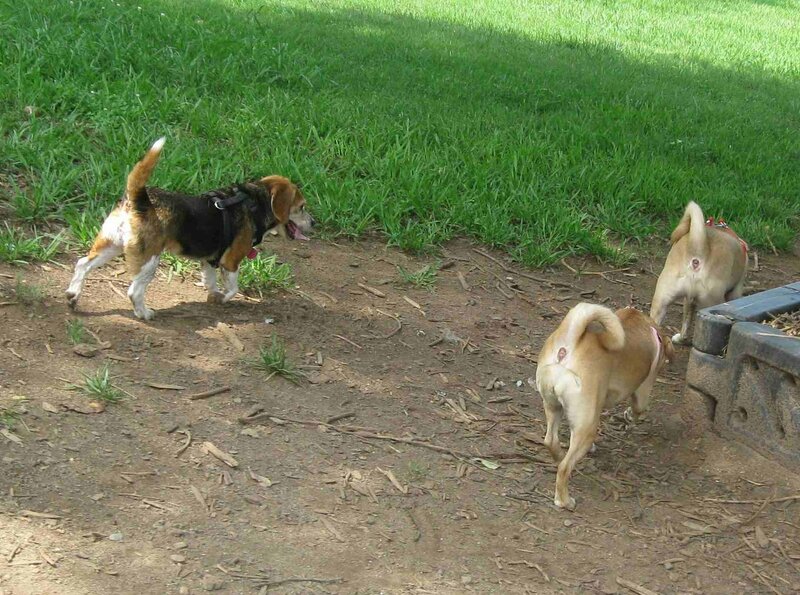 Jack has more Beagle in him! He is the sweetest and most loving little boy you ever did meet, however he is also a wild man who loves to play his game before bed, every night, of “catch me if you can”; He is scared of quite a few things including his shadow, noises, a fart, a sneeze, a blender, his tail if it creeps up on him during a nap! Yes, our little boy is quite a wimp at times! He has jowells and wrinkles all over, but you gotta kiss every single one of them! He loves to give kisses, and loves to all his friends/family. He finds it easy to make friends. This boy has a collection of “babies”. We found a bear (tiny puppy sized) at petsmart and that became his best friend. He now has 8 bears (exactly alike) 8 ducks (the same as the bear, just a duck) and 7 frogs. 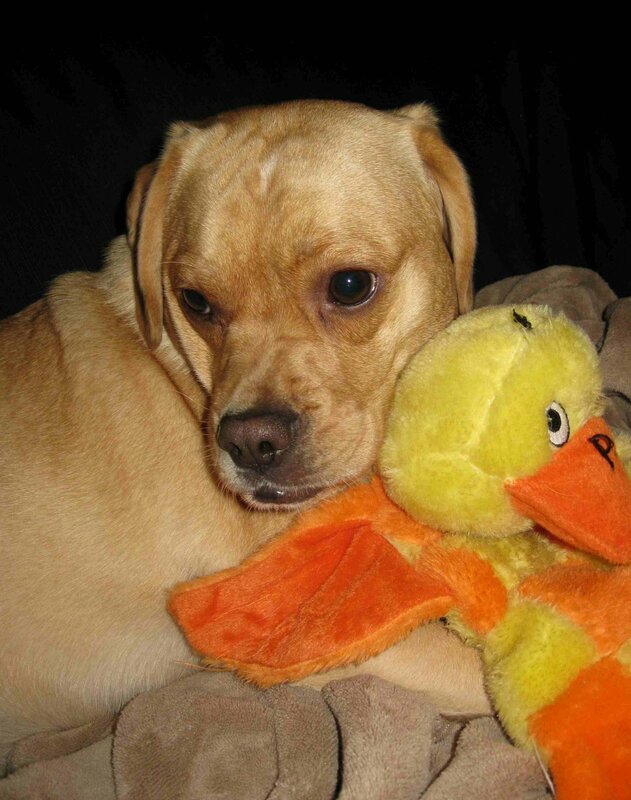 He also has a LARGE FLUFFY DUCK that he LOVES to pieces, and a duck with 12 squeekers in it’s body. He will carry a mouthfull of his little babies around most of the time. Whenever someone comes into the room, he looks around and finds a baby of his that he doesn’t mind sharing, and will jump up and honestly want to share his baby. He is almost offended if the person doesn’t accept his baby from him. Ella, on the other hand, is more of a chewere. We try to give her a bear and end up with nothing left….. We have found the only product that she can chew and not throw back up is the Nyla Bone line of toys, so she has several of these that she loves. She also loves her bone with the hollow center, where we put peanut butter in it, or even loop a blankie through it and make a cute little pull toy. And she (and Jack) both love their Kongs. Kongs are some of their favorite, and upon recieving their first Kongs, Ella chose the red colored and Jack got stuck with (and LOVES) the purple colored one…..
Ella also LOVES tummy rubs….If she doesn’t get her tummy rub quota each day, you can tell. We call her our diva princess, as she thinks she is everything! Haha! If she gets caught doing something she KNOWS she shouldn’t do, she gives you a big look in the eyes and rolls over for a tummy rub to make things all better! 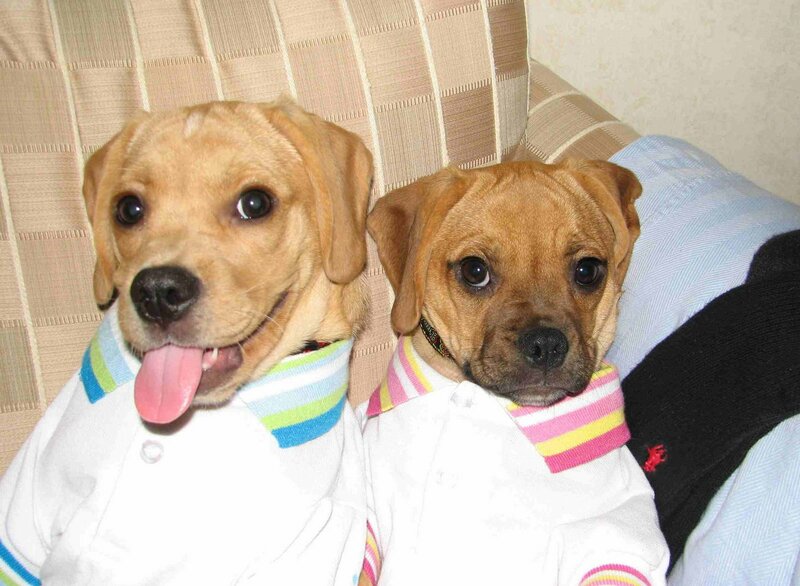 So, anyway, that is about it for my puppies background. They recently turned two years old in May and they are my best friends…. I will post one picture for now, to go along with this post and then play some catchup by continuing to add pictures as I learn more about how to compile this blog…. Enjoy and please check back often!